July in the Old Olive Press is dedicated to handmade creations: Kaftans (Christina’s Kaftans), accessories (Catherine Wheel) and jewellery (Lygia Mozora). On Sunday 30th June at 20:30 come to see a different view on fashion, with beautiful “girls next door” presenting us clothes and accessories made with fun spirit, art and a lot of love for people that will appreciate them and will not find it hard to acquire them for their carefree summer moments. 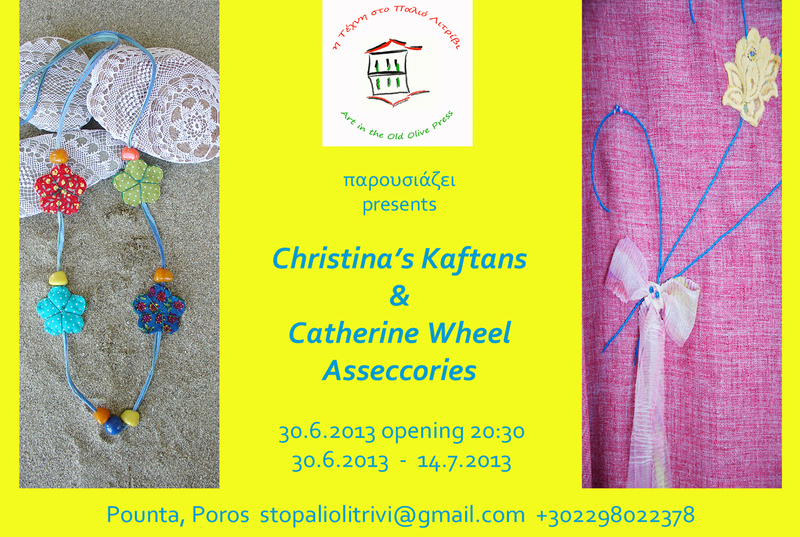 In the first fortnight of July (30/6-14/7) Christina Orfanidou (Christina’s Kaftans) and Katerina Karoumpa (Catherine Wheel) present handmade kaftans and accessories respectively, whilst in the second fortnight (15/7-31/7) Lygia Mozora brings us jewellery and unique creations made of seeds. Come to talk to the artists, admire their work and obtain unique handmade creations.